Polemonium reptans commonly known as Abscess Root, Creeping or Spreading Jacob’s Ladder, False Jacob’s Ladder, American Greek Valerian, Blue bells, Stairway to Heaven, Sweatroot, Skunk Weed, Onechte Jacobsladder and Polemonie Fausse is a flowering plant in the polemoniaceae (phlox family) and genus Polemonium, native to eastern North America. 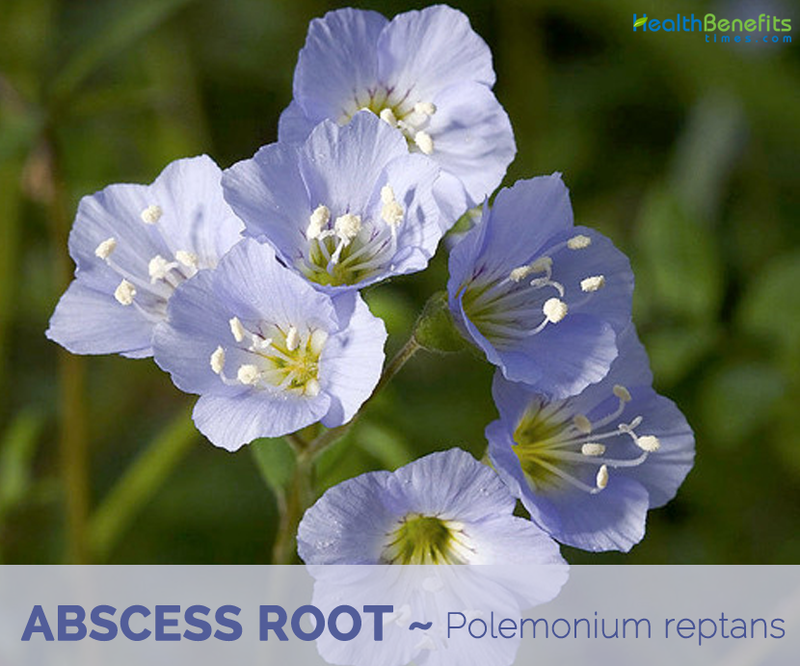 Abscess root is also called “false Jacob’s ladder,” because it has astringent activity similar to Jacob’s ladder. These two plants are used in similar ways, but differ chemically. It also gets its common name from the pairs of opposite leaflets on the compound leaves which resemble a series of steps on a ladder. Genus name comes from the Greek name polemonion originally applied to a medicinal plant associated with Polemon of Cappadocia. 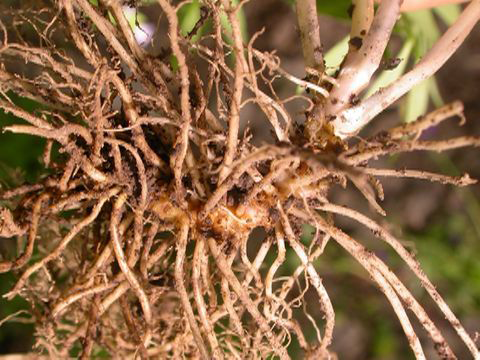 Abscess root is a perennial herbaceous plant that grows about 1 to 3 feet high with a spread of 1 1/2 to 2 feet wide. 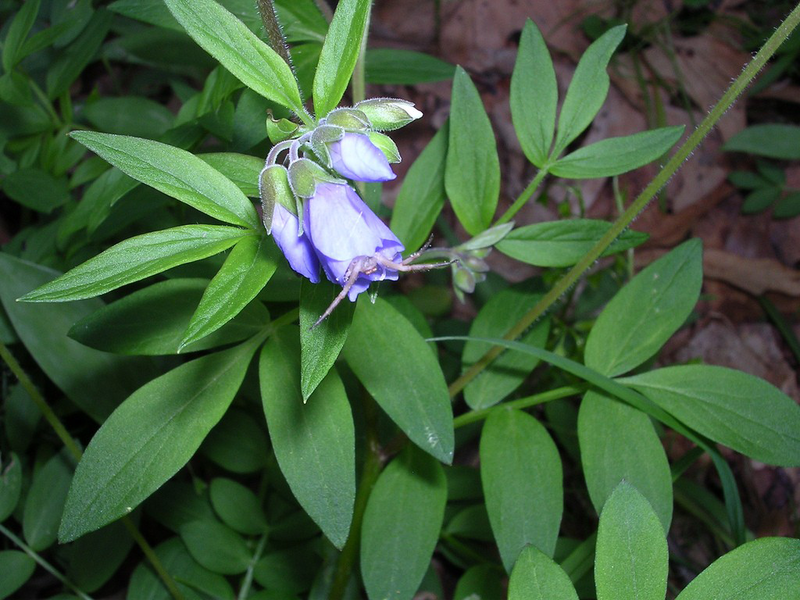 The herb is found growing in deciduous woodlands, lower wooded slopes, bases of bluffs, shaded banks of streams and rivers, bottoms of sandstone canyons, and areas along woodland paths. Normally it prefers moist, humusy, well drained and sandy soil. It has creeping roots, by which it multiplies very quickly. The root is rarely used in modern herbalism. It is harvested in the autumn and dried for later use. 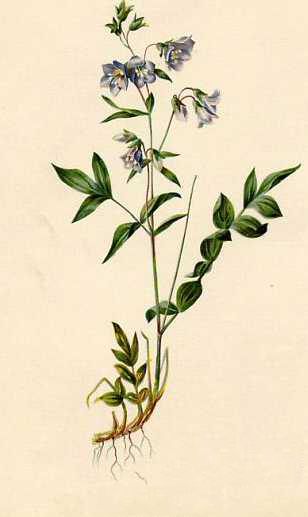 The dried roots have a slightly bitter and acrid taste and are used medicinally. 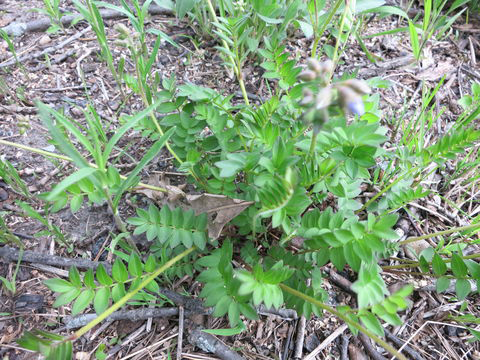 Stems are 9 to 10 inches high and are much branched. 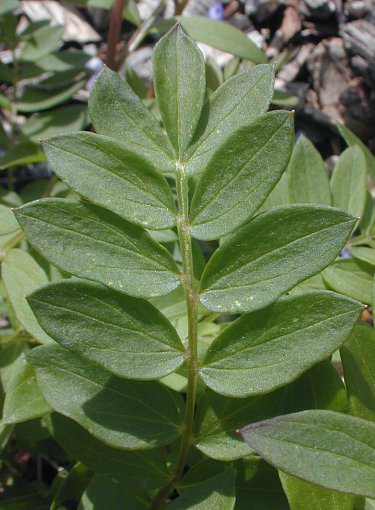 The glabrous stems are heavily branched and bear alternate or opposite, pinnatifid leaves with 6 or 7 pairs of leaflets. 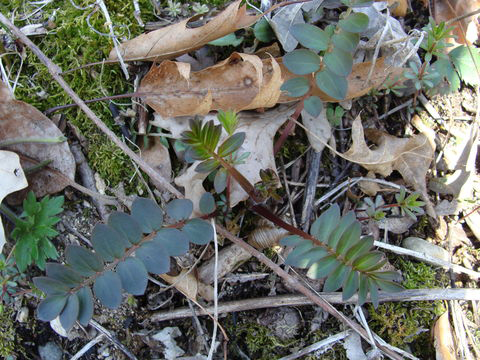 The leaves are alternate, compound and are odd pinnate, consisting of about 5–15 leaflets, and they are up to 20 cm long. 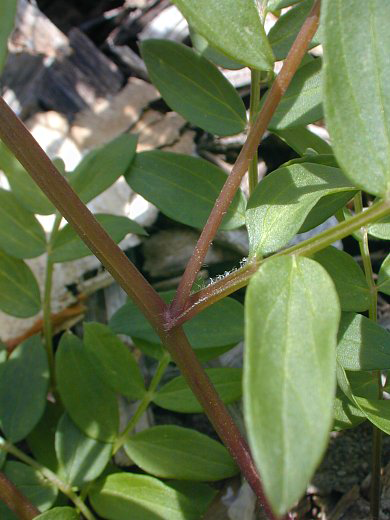 The leaves have white hairs at the base of the petioles of the compound leaves. Each leaflet is ranges from oval shape to ovate shaped. Flowers are produced in panicles on weak stems from mid to late spring. The flowers are bell-shaped and are about 1.3 cm (1⁄2 in) long. Each flower has 5 rounded petals with 5 stamens and white anthers. 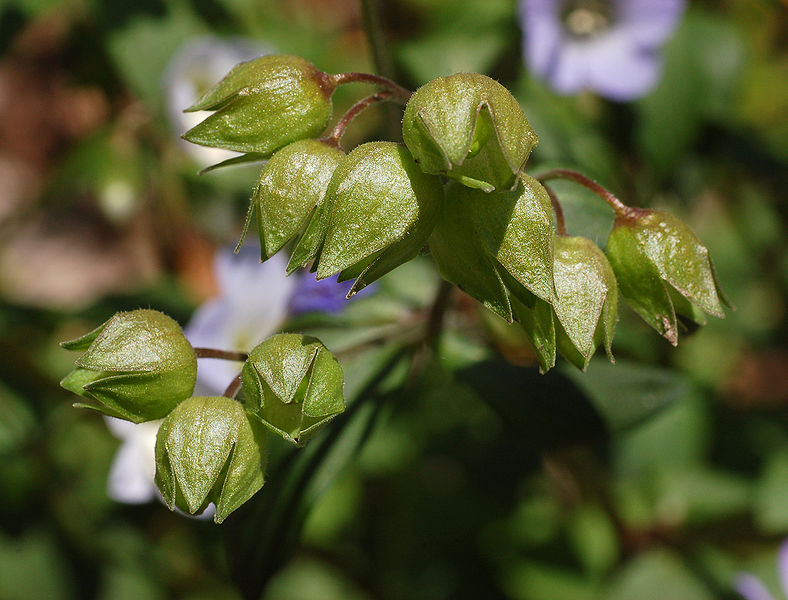 The flowers can be blue, lavender, pink, purple or white petals that are fused at the base, enclosed by a tubular calyx with five pointed lobes. The pollen is white. The stigma extends beyond the anthers, making self-pollination difficult, so insects must cross-pollinate for the plants to produce seed. Pollinated flowers develop into an oval pod with three chambers, 6 mm (1⁄2 in) long, which is enclosed by the green calyx. The seeds are inside oval pods and the flower is spread by reseeding itself. The flowers are edible and taste good in salad. The root is rarely used in modern herbalism. It is harvested in the autumn and dried for later use. 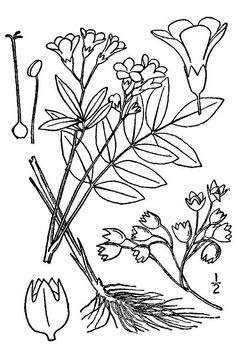 The slender rootstock, when dried and used as the drug, is 1 to 2 inches long and 1/8 inch in diameter, with the bases of numerous stems on the upper surface, and tufts of pale, slender, smooth, wiry, brittle roots on the underside. The rootstock has a slightly bitter and acrid taste. Polemonium ‘Album’: This variety bears White Flowering. 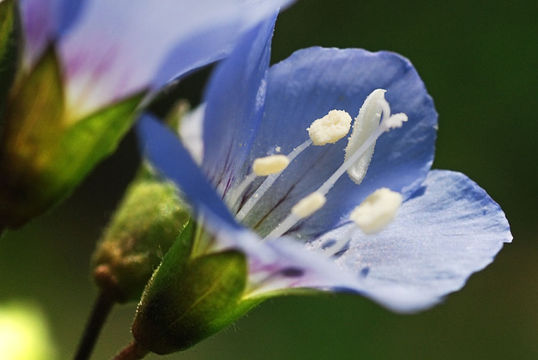 Polemonium – ‘Bambino Blue’: This variety has beautiful light blue flowers. 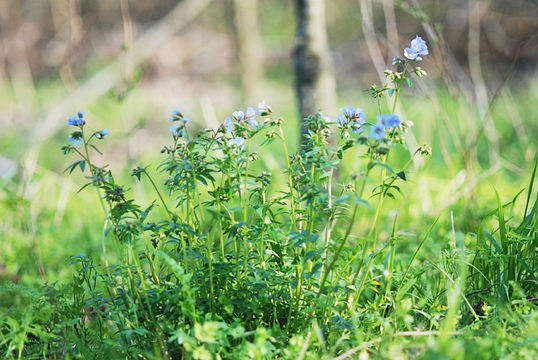 Polemonium ‘Snow and Sapphires’: The plant has variegated leaves and blue flowers. It is somewhat heartier than the similar ‘Brise d’Anjou’. It is 24 to 30 inches tall. 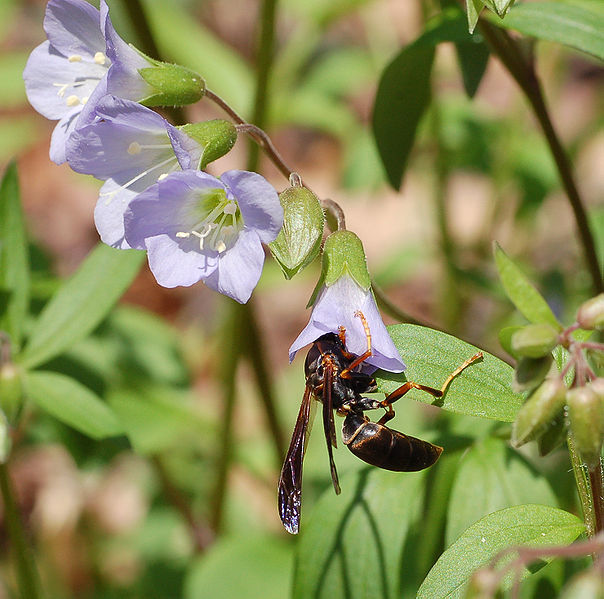 Polemonium ‘Stairway to Heaven’: The plant has blue flowers on variegated foliage that blushes pink, in cool weather. The plant is about 12 to 24 inches tall. Dried roots are alterative, astringent, diaphoretic, expectorant and pectoral. They can be used in an infusion with water or as a tincture with alcohol. They are used internally in the treatment of coughs, colds, bronchitis, laryngitis, tuberculosis, feverish and inflammatory diseases, including skin conditions and poisonous bites. 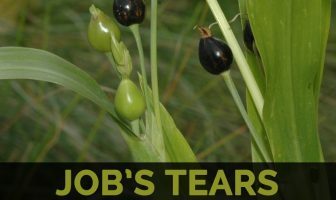 The drug has been suggested for use in febrile and inflammatory eases, all scrofulous diseases, in bowel complaints requiring an astringent, for the bites of venomous snakes and insects, for bronchitis and laryngitis and whenever an alternative is required. An infusion of the root in wineglassful doses is useful in coughs, colds and all lung complaints, producing copious perspiration. Root is usually recommended for usage in febrile and inflammatory reliefs. Internally, the abscess root herbs are used for the treatment of colds, coughs, bronchitis, laryngitis, tuberculosis, and several fevers. The herbal roots are very effective for treating many inflammatory diseases including different skin conditions and poisonous bites of snakes and insects. This root is used to reduce swelling and to cause sweating. The roots are used as a drying agent and also to loosen the chest congestion. In addition, the roots are used in case of scrofulous diseases and in bowel complaints. The roots of this effectual plant have proved to be an excellent astringent. The dose of any herbal remedy should be given according to the recommendation of the physician. However, the normal dosage of abscess root herb is 1-2 fluids ounce and is given two to three times a day. The dose also depends upon many factors like the age of the user, health and other conditions. It might cause slight side effects such as sneezing, gastro intestinal problems, and possibly some others. Abscess roots should not be used in pregnancy and breast feeding. The root is ground and used as a medicinal tea. The flowers are edible, taste good in salad. A decoction of the whole plant is used as a hair rinse.